I loved staying here. The hostel had an intimate, old school Paris vibe. The location was in the beautiful center of Le Quartier Latin, where I felt like a local. It was hugely beneficial to have a kitchen to use to cook, and a grocery store right next door to save money. The staff were friendly and personable. My only hangup is the old bunk beds - I stayed in an 8 person dorm and the bunk beds were old, creaky, and wobbly. I wish they had newer bunk beds with privacy panels and outlets. One of the best weeks of my life. Would stay here again in a heartbeat. Terrific location because rue Mouffetard is a joy of so many colorful street food and sit down restaurants and lively night life. Awesome location in the Latin Quarter. It is very close to many bars and restaurants. The rooms are clean and the staff was very helpful and nice. The location and staff was great, the luggage hold and security lockers were safe. There were plenty of showers and bathrooms but the bathrooms were not on our floor. The shower rooms provided soap but they were not very clean. The rooms had a lot of natural light and has sheets and a blanket, but limited outlets. 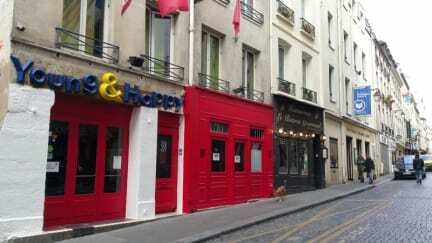 Great location in Latin quarter next to a supermarket and a bunch of great food choices. Staff were friendly and helpful. Only complaint is that there are only a few showers and bathrooms located on different floors for all the guests staying at the hostel. Also a little difficult to charge your devices if you're sleeping in the top bunks. We loved the location, situated on a great street with nice cafes, bars and shops. We walked to some main attractions like Notre Dame and the Luxembourg Gardens. The metro was also fairly close. The one main downside was that there were not enough power outlets in each room. However, we would visit again and recommend to others. Everything was very nice except the bathrooms could of used some work. Bathrooms were a little dirty and the main entry door was left open during the evening/night even though you had to ring a doorbell to get in during the day. One outlet for the room but they provide a power strip and even upgrade you to smaller room for free if there's space. The staff were very helpful and it's near some good bars, a metro station, as well as Notre Dame. The location of this hostel was good, but the rooms were very basic, the beds squeaked a lot, and there were no toilets on my floor. Had this hostel been cheap, that would have been fine. But it is VERY overpriced for the average services they offer.